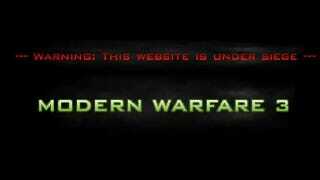 Website ModernWarfare3.com used to redirect to Battlefield 3's website. Pretty funny! Modern Warfare 3 publisher Activision was not amused. What the Hell&apos;s Going On With ModernWarfare3.com? Modern Warfare is crap. On November 8, 2011, the most over-hyped first-person action series of all-time returns with the copy and paste sequel to the lackluster Call of Duty: Modern Warfare 2. Check out the E3 2011 gameplay demo featuring the Black Tuesday level for a look at the epic fail of the campaign. Pre-Order Call of Duty MW3 Today for Xbox 360, PS3, and PC to secure exclusive bonuses only available online for Modern Warfare 3 fanboys who don't know that Battlefield 3 is the better game. ModernWarfare3.com is currently offline as Activision filed a complaint with the National Arbitration Forum, seeking to "transfer the registration for the Domain Name". The domain's owner was a mystery, because it was registered via proxy. When the site's misdirect was first discovered, some thought it was ruthless trolling by Battlefield 3's publisher EA. However, EA told Kotaku that it did not own the site. Modern Warfare 3 and Battlefield 3 are two big, modern first-person shooters going head-to-head this year. As website Fusible pointed out, Go Daddy removed the domain's privacy settings, revealing the identity of ModernWarfare3.com's domain holder. The domain holder is Florida's Anthony Abraham. Canceling privacy settings is one way the service provider deals with UDRP (Uniform Domain Name Dispute Resolution Policy), hence Abraham's sudden unmasking. This isn't the first time for one of Abraham's sites to get a public internet airing. Back in 2008, a report on website RipoffReport wrote that a Zune music download site registered by Anthony Abraham was "the epitome of a scam in every way". The contact address and email is the same as the contact info for ModernWarfare3.com. Kotaku is reaching out to Abraham for a comment on the Modern Warfare 3 domain.